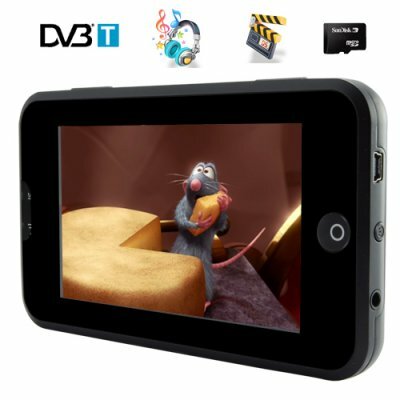 Successfully Added 4.3 Inch Widescreen Portable Media Player (DVB-T MP3 MP4 FM) to your Shopping Cart. Handheld multimedia system with a 4.3 inch widescreen LCD display and 8GB's of internal memory. The CVGI-E41 also comes with a micro SD card card slot for adding additional memory, two stereo speakers and DVB-T to round out its primary feature set. With straight and simple navigation menu system, you can instantly access all your media content within just a few seconds. To enjoy your music and videos privately, just insert the earphones into the 3.5mm jack input and listen to amazing audio output clarity. The CVGI-E41 also comes with a table kick stand, so even when your at work, you can have your multimedia station right next to your monitor while working. With a mini-USB connection it is easy to transfer files onto your new digital media player from your computer. This is an amazing portable media unit that is perfect to take when traveling. The CVGI-E41 is built with a finely detailed molded casing and polycarb front panel to protect the inner screen, meaning it can be safely carried around in your bag or pack without having to worry about the daily wear and tear you can expect in the busy modern life. If you are often away from home when your favorite football team is playing, then you will simply love this unit!! The CVGI-E41 is the perfect companion to keep you entertained on your journey because its intelligent DVB-T digital TV function will allow you to not miss a minute of the action. With most of Europe using DVB-T, you can enjoy crystal clear free view TV on the go. Whats more, with the mega 8GB flash memory and additional external memory, you can use the CVGI-E41 as an ultra-convenient media storage device. The CVGI-E41 can be connected to your TV using the included AV cable so you can watch your collection of digital media files on your living rooms big screen TV. This simple and elegant media station that is not much bigger than an iPhone is available for single and bulk purchases. Get yours today at an amazing factory direct wholesale price from the leader in wholesale electronics, Chinavasion. How can I navigate back to the main menu? Just long press the return key and you will be directed back to the main menu. Will CVGI-E41 work in North America? The DVB-T function will not work in North America, but all other function will work just great. Llego rapido, bien embalado y funcionando correctamente. Servicio,rapido y serio en todo momento estas informado. 3 days to come to Spain. High battery autonomy. It can be charged by external adapter (very fast) and by usb port (much slower). In Spain TV works fine and music (even with tiny loudspeakers) sound very well.